We used calendar pictures of birds for inspiration in this project. Before we started drawing we discussed proportion and placement. Each student was given a bird picture to reference while we discussed the shape of the bird body (like a raindrop); the head size in comparison to the body size (can be different on different species); the angle and size of the beak; the length of the tail; and the angle of the legs. The students then pencil drew the bird and comparable surroundings as the calendar picture. They colored the birds with oil pastels and finished with a colored chalk background. 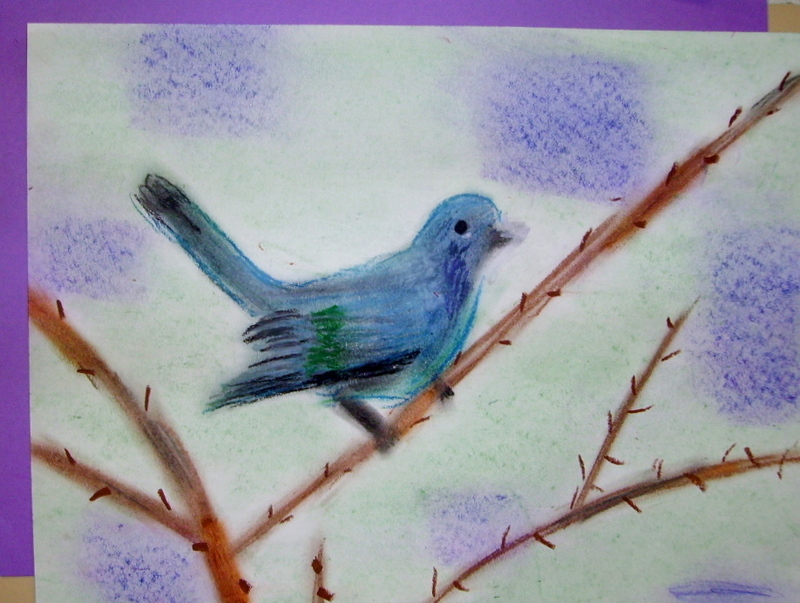 For further information on this project see “Drawing Birds” in the 6th Grade Projects Gallery in the sidebar. This entry was posted in 6th Grade and tagged 6thgrade, art and crafts, art projects for kids, birds, calendar pictures, classroom projects for kids, drawing birds, easy bird drawing for kids, how to draw birds, oil pastels, project. Bookmark the permalink.